A bear there was, a bear! Oh Budapest. I will be very sad to go in two weeks. Friday afternoon I finished class at noon and took the bus downtown in search of a good guidebook for Istanbul (where I am going. In two weeks. So excited!). On my way back, I dropped by the Vásárcsarnok and picked up a giant bunch of medvehagyma. The word means bear onions*, but we call them ramsons, ramp, or broad-leaved garlic in English. If you’re ever lucky enough to find these near you, buy some. They’re garlicky and fresh and so delicious, so I thought I would share my totally improvised recipe for bear onion champ. You can replace the bear onions with any green, but it won’t be quite the same. The bear onions were way too big to fit in my backpack (and they smelled pretty strong) so I carried them back to my apartment on the crowded, hot bus like the world’s stinkiest bouquet. At least I got some space to myself on the bus; no one wanted to stand near me! Wash the leaves (mine had a bit of dust on them) and remove any brown or rotted pieces. No need to dry them–the water actually helps them steam a little. Trim off the bottom half of the stems. 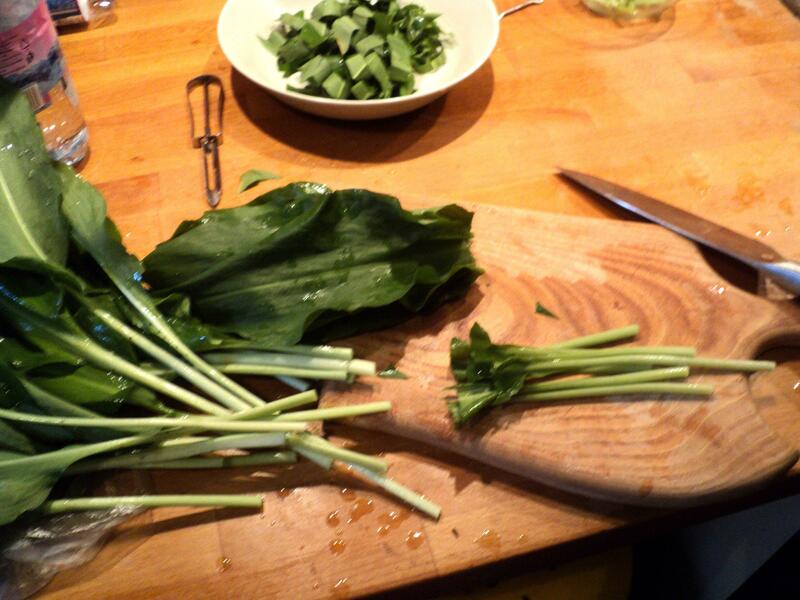 Cut the thin part of the stems away from the leaves. Slice into thin rounds and set aside in a bowl. Then slice into thin ribbons. This photo actually shows ribbons a little thicker than the ideal. You can make this with spinach (in which case discard the stems), baby spinach (ignore the stems entirely–they are just as tender as the leaf and do not usually need to be trimmed), or chard (remove center rib and slice thinly. Leaves may need more time). If you are not making this with bear onions, you may add more garlic, to your taste. Place peeled potatoes in a pot, cover with cold water and bring to a boil, uncovered, until potatoes are fork-tender. Mash with sour cream and salt. 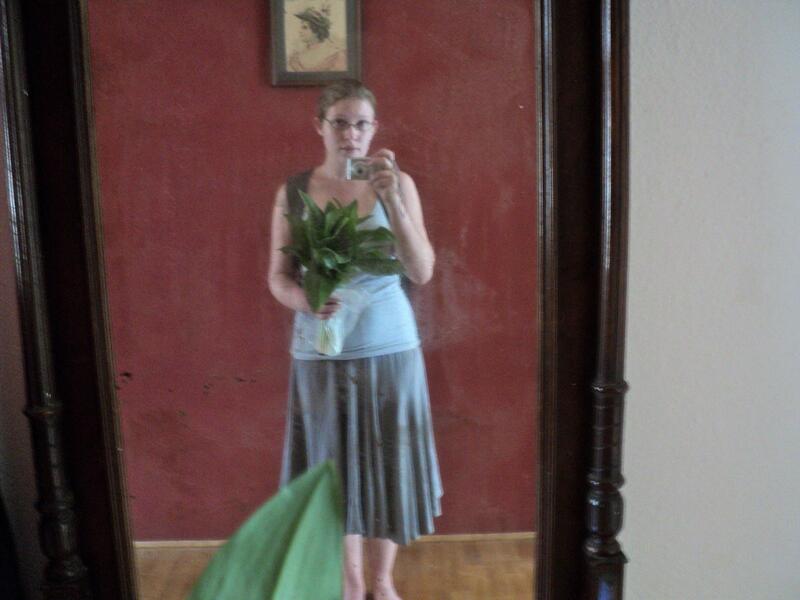 Meanwhile, prepare greens. Heat butter in a pan until melted and add garlic and stems. Stir over medium heat until stems are crisp-tender. 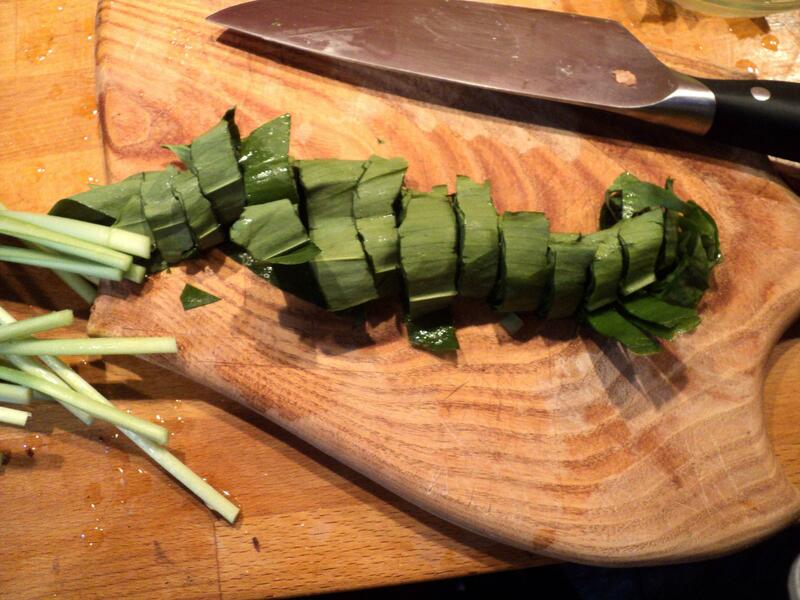 Add leaves, a sprinkle of salt, and a few tablespoons of stock or water. 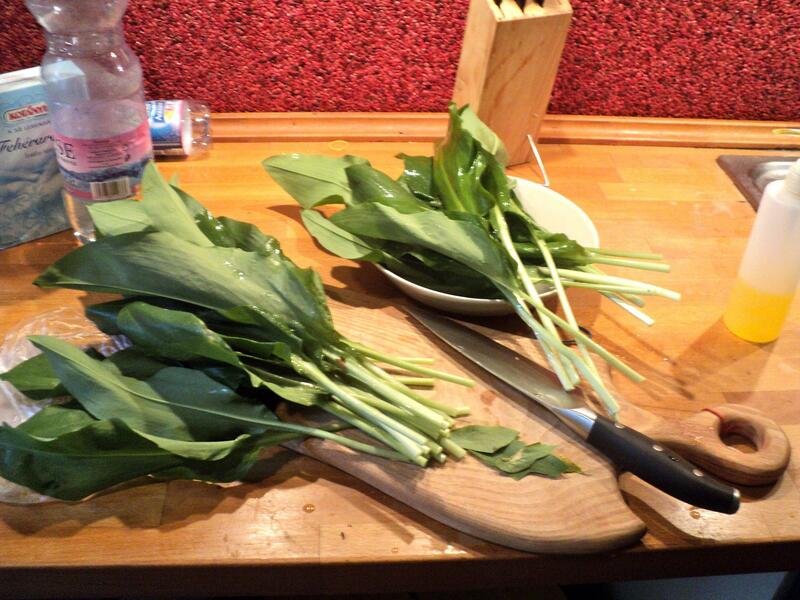 Stir, turning the stems and garlic on top of the leaves to help the wilting process. 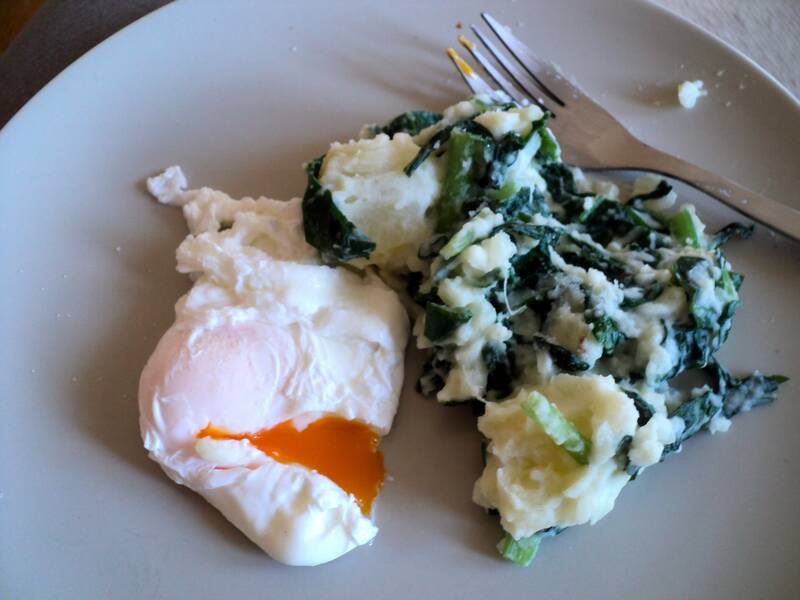 When leaves are cooked to your liking, remove pan from heat and stir greens into mashed potatoes. Serve with poached eggs. Dinner! I am still not over the bright orange eggs we have here. Crazy. 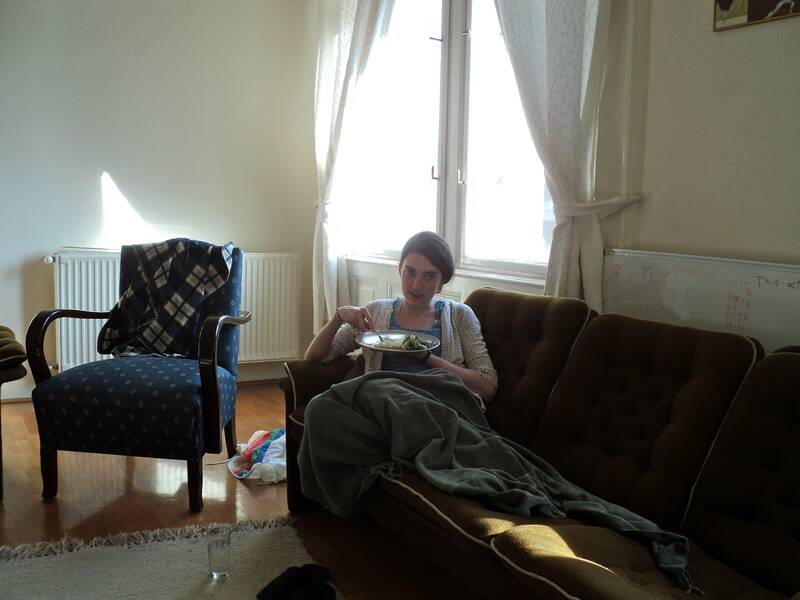 Hannah, enjoying dinner (probably) in our living room. *According to wikipedia, they are so named because brown bears are fond of them. But I was reading the English translation of the wiki page, which claims they are also known as ‘Priate washing-follicles’ so take it with a grain of salt. I am planning to make pasta carbonara with a generous helping of green garlic and possibly spinach tonight. I thought green garlic was the same thing as ramps but green garlic looks more like scallions rather than the broad-leafed plant that you show here. 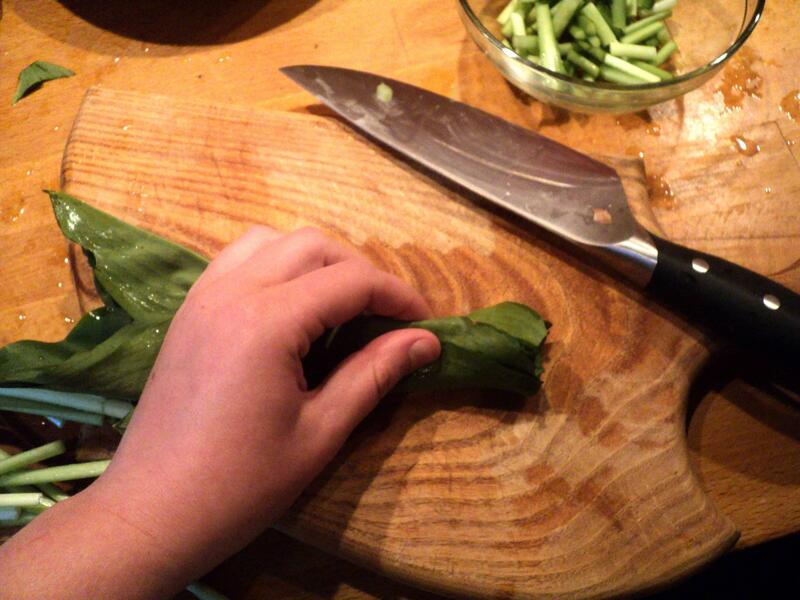 The flavor of green garlic sounds very similar to that of bear onions. Maybe they are related? Hungary is close to Romania. I wonder if Bear greens keep vampires away. At least it works with bus passengers. It reminds me of the medieval plague sufferers carrying poseys. Maybe those were really bear greens too. You make a good point Wheaton. I imagine that Hungary is host to quite a vampire population and as such we should probably prepare some sort of garlic/holy water bath in which to immerse Ariana upon her return. I, for one, have little desire to begin sparkling. Also, I just want to note that I have been super duperly impressed with your photography skills as of late. Props! Sorry my title confused you. It’s actually a very catchy, rather awful song from Game of Thrones…naturally. Glad you like the photos, though. Thanks!